On Thursday 11th May, over 100 delegates from across industry, government and academia gathered at the IfM in Cambridge to consider the implications of the next production revolution. The day provided senior industrialists and policy makers with the opportunity to cover a wide range of manufacturing topics and consider how they would affect them and their organisation. Over the rest of the day, delegates were able to hear about the latest research, research collaborations and how research-based tools and techniques have been applied in both industrial contexts and in the public sector. Delegates also had the opportunity to hear from the Guest Speaker, Alistair Nolan, Senior Policy Analyst in the OCED Directorate for Science, Technology and Innovation. Alistair's presentation coincided with the launch of a new publication from the OCED entitled 'The Next Production Revolution: Implications for Governments and Businesses'. 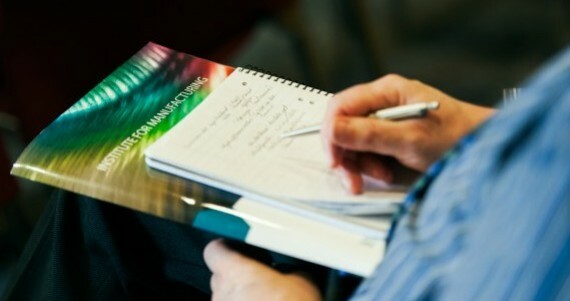 This publications includes a chapter ‘An international review of emerging manufacturing R&D priorities and policies for the next production revolution’ by Dr Eoin O’Sullivan, Director, Centre for Science, Technology and Innovation Policy (CSTI) and Dr Carlos López-Gómez, Head, Policy Links Unit, IfM ECS. Keep up to date with the latest IfM news by signing up here. You can download presentations from the day through the links below. Manufacturing a better world: Whats new at the IfM?